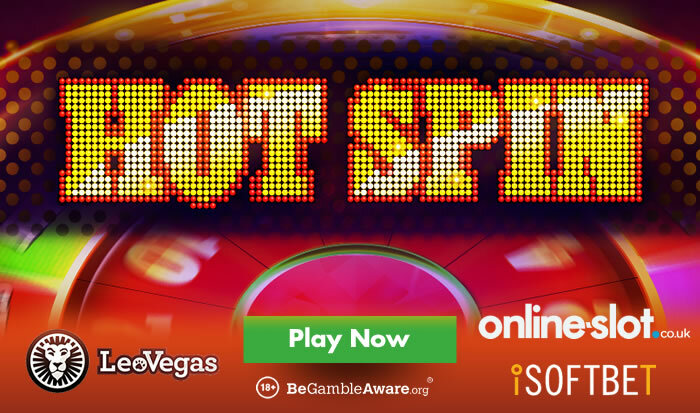 The appetite for the classic fruit machine remains as strong as ever among online casino players with iSoftBet the latest developer to deliver an old school slot in the form of Hot Spin. It’s a 5 reel, 20 payline game that features all the imagery you’d expect to find in a classic fruity. Top of the pops as far as payouts are concerned is the diamond which awards 25 times your stake for a 5-in-a-row combination. Above the main set of reels is the Hot Wheel. This comes into its own when you trigger the Hot Wheel feature. You do that in the usual manner by landing scatters on reels 1, 3 and 5 on the same spin. The inner ring of the Hot Wheel will spin. In Sync Reels – between 2 & 5 reels will sync on each free spin, showing the same matching symbols. You could also be randomly awarded a Hot Spin in the base game. This is a single spin where 1 of the modifiers is live. iSoftBet has packed plenty of extras into this old school slot, especially when you trigger the feature round. If you enjoy the simple pleasures offered by a classic fruit machine with an odd twist or 2 thrown in, then Hot Spin is well worth a look. It’s on general release now but I recommend you play it at LeoVegas Casino – they have over 1,000 slots including lots of new releases like Novomatic’s Stein Haus, NextGen Gaming’s Kingdom’s Edge, Play ‘N Go’s Rise of Olympus and Pragmatic Play’s Peking Luck. Register now to get 20 no deposit spins on Play ‘N Go’s Book of Dead, a 100% first deposit bonus up to £300 plus 30 more Book of Dead spins (on deposit).